Human nature and psychological test. 6. ( L ) the left eyebrow - not obvious ethical function. 5. ( R ) the right eyebrow - obvious logic function. 4. 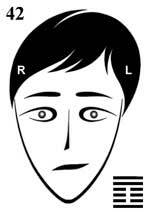 ( L ) the left eye - obvious extravert. 3. ( R ) the right eye - not obvious introvert. Eyebrows - combined perception of sign and figurative energy, and also detailed and generalized matter. Eyes - combined perception of active and passive movement, and also life involved and unvolved in world around.